With our experience, skills, and compassion, you can rely on INTEGRATIVE FAMILY DENTISTRY for all of your family dental care needs. We provide comprehensive care, ranging from cosmetic dentistry to implantology, and beyond, to people of all ages nestled between the Triad and Triangle regions of North Carolina. From our state-of-the-art office in Mebane, North Carolina, INTEGRATIVE FAMILY DENTISTRY provides premium oral health care services to people of all ages. Our comprehensive dentists, Drs. Jacqueline Garner and Ralph Mensah, understand that dentistry is about more than just fixing teeth; it's about building relationships and creating an environment where everyone can feel comfortable. At INTEGRATIVE FAMILY DENTISTRY, we incorporate oral health education, the latest dental technology, quality dental care, and patient compliance to create a positive dental experience for the entire family. This integrative approach to dentistry allows us to treat you more fully and more effectively than many other dentists. INTEGRATIVE FAMILY DENTISTRY strives to provide quality dental care while defining new standards for care. 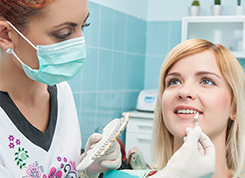 We will provide comprehensive dental care to all patients through in-depth patient oral hygiene education, detailed oral diagnosis, extensive treatment options, and informed consent, all in a relaxing and caring environment.